Registration procedures for the 2013 SportAccord-Pandanet Cup Online Go Tournament have just been announced. Participants must be amateurs and may choose to enter one of four classes (“bands”): open, 4d-1k, 2k-7k, 8k-17k. Except in the Open class, players are required to have a registered and IGS-confirmed rank. In addition, players may choose one of three geographic regions to play their games. Registration starts now and ends on August 18. The preliminary rounds will be played August 22 through September 12. This tournament is supported by SportAccord and Pandanet and organized by the International Go Federation and Pandanet. 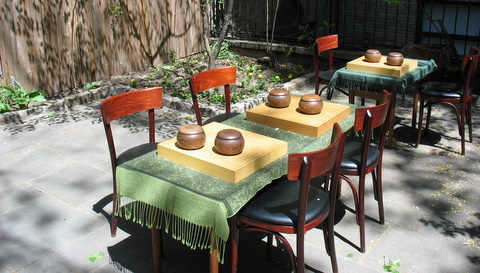 It also concurrently serves as the 18th Pandanet Cup Internet World Amateur Go Tournament. Players may advance based on their results within their class and region. Generous prizes are provided by the sponsors, including a round trip to the Third Beijing SportAccord World Mind Games for the open champion. Further prizes are provided for regional and class winners. In addition, anyone who finishes six or more games in the preliminary rounds is eligible for lottery prizes provided by SportAccord. In 2012 these prizes included an iPad, Swatches and cameras, and comparable prizes will be offered in 2013. Click here for details and registration forms. The upcoming online “Long Live the King!” final qualifier will be strong players’ last chance to earn points towards this year’s North American Masters Tournament (NAMT) at the 2013 US Go Congress in Tacoma, WA in August. To check how many points you have accumulated, please click here to view the spreadsheet. The four-round tournament will take place July 6-7 on KGS in the AGA Tournaments Room, and will be directed by Todd Heidenreich. Deadline to register is July 3; for details, rules, and registration click here. Registration and participation is free, and every player in the tournament is guaranteed to earn some points. The outright winner of the tournament will automatically qualify to play in NAMT. Spain: At the II Open de Bilbao on June 16, Kiichi Matsumoto 1k bested Miguel-Angel Antolinez 2d and Alejandro Menendez 8k placed third. KGS: On June 23, French player Tanguy Le Calve 5d (Welvang on KGS) led his nine-player team to victory against German team leader Oliver Wolf 4d (sinsai on KGS) in the French-German Youth Friendship Match. There were three players per age group (U18, U15, and U11) with the each team leader on board one. In the end, France triumphed 5-4. Live commentary on select games by Hwan In-seong 8d (including the match between Wolf and Le Calve) can be found here. Slovakia: Jan Simara 6d (right) dominated the Slovak Go Festival on June 23 while Ondrej Silt 6d came in second and Dominik Boviz 3d in third. A Welshman had dominion over all comers in his native land last weekend. Dylan Carter 1d of Cardiff took the Welsh Open from a field of 27, mostly English, at Barmouth June 22-23. It was a neck-and-neck finish, with Carter and two others, Richard Hunter 3d of Bristol and Toby Manning 2d of Leicester all entering the final round with a chance of winning – and each going on to win his game in that round. In the end the Welshman triumphed by just half a SOS point. Also distinguishing themselves with four wins were John Green 4k of Leamington and Colin Maclennan 10k of Twickenham. The tournament was a five-round MacMahon, with the bar at 1-dan. Click here for full results. Wales is one of the four main territories which make up the United Kingdom of Great Britain and Northern Ireland (the UK) – the others being England, Scotland and Northern Ireland. It is a country with its own National Assembly, its own Celtic language* and its own Open Go Tournament. Scotland holds its own Open Tournament, too (see June 1 EJ report) and both are in addition to the British Open (see April 8 EJ report). 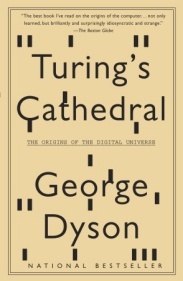 Though go games be lost, the game of go shall not. - Report by Tony Collman, British Correspondent for the E-Journal, based partly on a report on the British Go Association’s website. *Welsh - unrelated to English which is, however, now the most widely-spoken language (80%) there. Strong Players Face July 1 Deadline for SPO Eligibility: Strong players who register for the US Go Congress by July 1st have the chance to be invited to participate in this year’s Strong Players Open (SPO), which will run simultaneously with the North American Masters Tournament (NAMT). This year’s Congress runs August 3-11 in Tacoma, WA. This 16-player, 4-round event is designed to provide a strong tournament – in addition to the US Open — for professionals and amateurs who did not or could not qualify for the NAMT. There are no citizenship, residency, or length of membership requirements for the SPO, just full Go Congress registration by July 1st. After that, the strongest players who have registered will be invited to participate in the Strong Players Open and the strongest 16 players who accept will be selected for the tournament. Soccer & Tennis Confirmed: In breaking U.S. Go Congress sports news, the E-Journal can now confirm that there will be both soccer and tennis at this year’s Congress. “Bring your cleats and shorts,” Terry Benson urges soccer players, while tennis players should bring their racquets and tennis balls, says Chris Garlock. “Soccer every afternoon at 4:30 except for Saturday and Wednesday, field TBD,” says Benson. “All ages come and play. Let your body loose and your mind run free!” Garlock and Lisa Schrag will coordinate the tennis action at the PLU courts, most likely at the same time. Check in at the EJ office at the Congress to confirm. 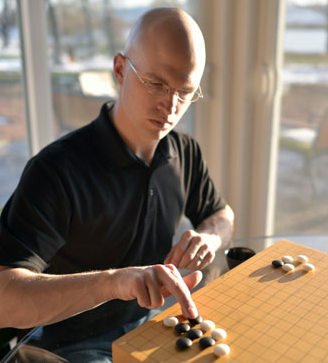 Sighted go players who struggle to master the game of go may be surprised to learn that many blind people in Japan know how to play go, and that there are clubs with blind players who meet on a regular basis. 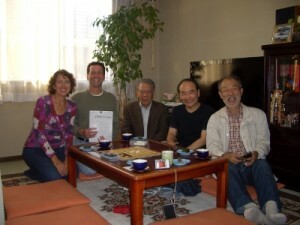 Last Fall, Bay Area Go Players Association board members Roger and Lisa Schrag traveled to Japan and met with Mr. Fumio Miyano (second from right in photo) of the Japan Go Society for the Visually Impaired in Osaka, Japan. 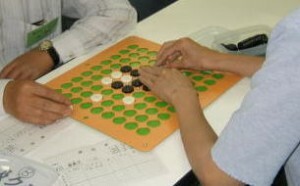 The Society produces special 9×9 and 19×19 go sets and Braille go books so that blind and visually impaired people can play go. 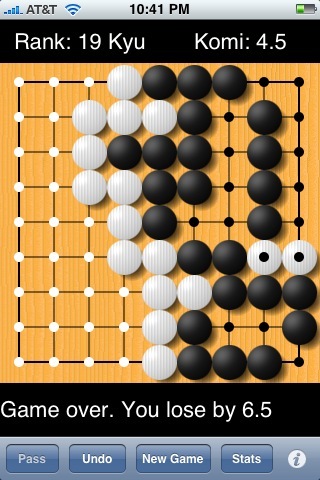 Black and white stones can be differentiated by feel, grid lines are raised, and the stones fit into holes in the board so that they will not move when a player touches them to read the board position. The Japan Go Society for the Visually Impaired also hosts an annual international go tournament for blind players. There are some strong go players out there who are blind. Nakamaru Hitoshi of Japan and Song Jung-taek of Korea, for example, each are rated at 5 dan. The Society has provided Bay Area Go Players Association with a special 9×9 go set and Braille go materials. “If you have a blind or visually impaired friend in the San Francisco Bay Area interested in learning to play go, we now have the necessary equipment to teach them,” says Roger Schrag; contact him for details and to make arrangements.